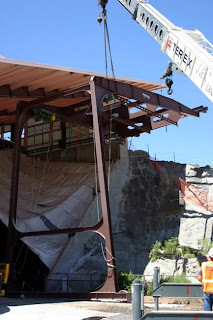 Once pulled out of the building beyond the overhang of the roof, the QVC crane was lifted and moved to the center of the parking lot, where it will be disassembled. 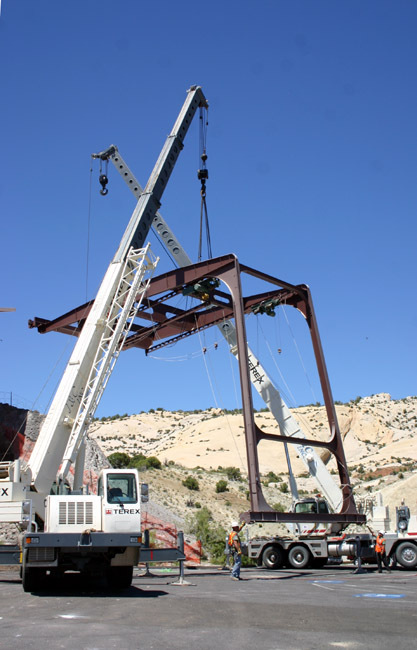 It was a graceful pas de deux of machines as the QVC crane, suspended between the two lifting cranes, moved sideways, and eventually came to rest on its upper and lower ends. However, the 28,000 pound weight of the crane was made evident in the large and deep compression in the asphalt made by one of the stabilizer legs of the lifting cranes. 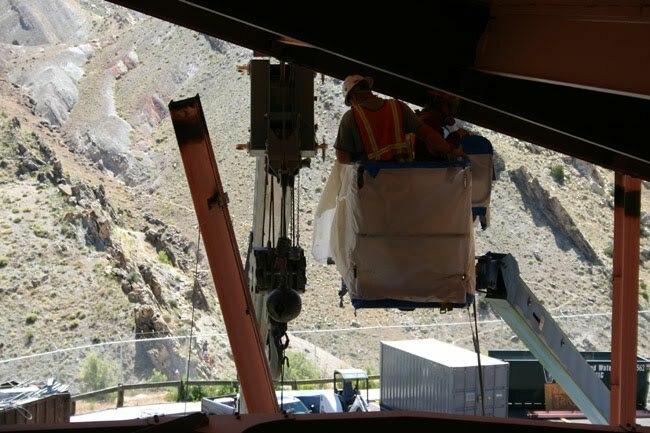 The crane operators and their teams (shown above) deserve a round of applause for pulling off one of the most spectacular and unusual paleontological resource management actions ever undertaken anywhere in the world. Throughout the entire Quarry Visitor Center rehab project, one part was always seen as a looming menace and universally recognized as the greatest threat to the fossils. That component was getting the crane out of the Visitor Center without damaging the bones. 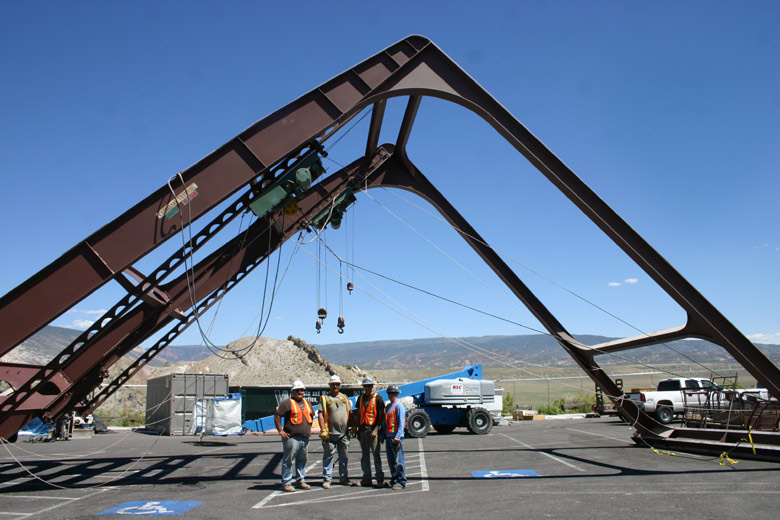 Given its weight, removing the crane was a challenge. And there really weren’t too many options. 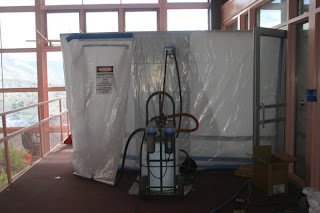 The first was to take it apart, either cutting it up or disassembling it, inside the Visitor Center. This was fraught with problems. How would one hold up the entire crane while pieces were removed and how would the pieces taken off be moved and taken out of the building? Space inside the QVC is limited and there is not sufficient space to have multiple large pieces of equipment inside the building holding and moving heavy pieces of the crane. Dropping a bolt from the crane would be bad enough, but dropping a separated subunit of the crane would be catastrophic. 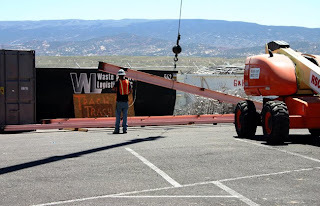 The alternative was to take the crane out of the building intact and take it apart in the parking lot. 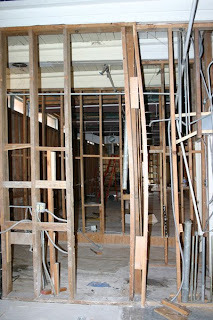 Fortunately, the plans for rehabing the QVC included replacing the glass walls. Of particular relevance to the crane problem was the multitude of problems involving the east wall of windows. 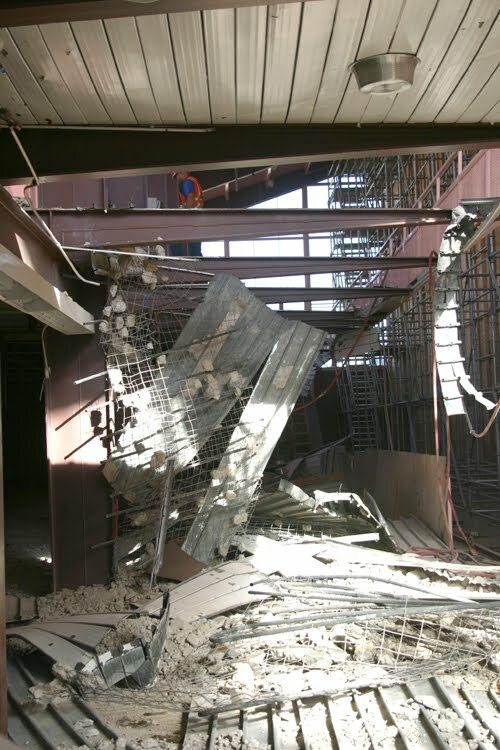 The most serious of the problems was that it had pulled off the foundation and was hanging by the welds to the roof beams. 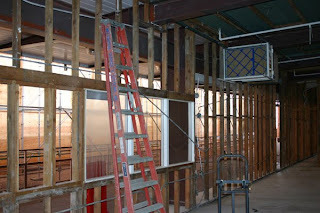 Repairing that problem required removing all of the glass on the east wall as well as the window framing and I-beams. So the entire glass wall would at some point be gone. That gave an opening for getting the crane out. 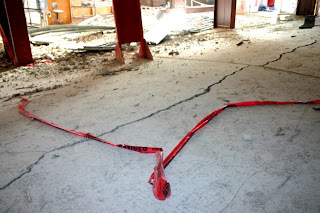 Eventually the plan developed was to extend the track railing on the floor outside the building and into the parking lot. 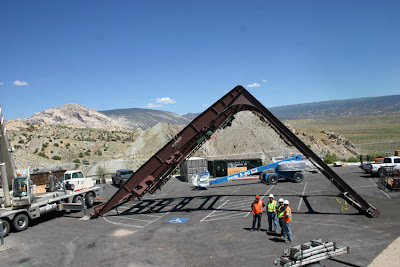 Two large cranes, each with a lift capacity of 50,000 pounds, would attach chains to the crane and slowly pull it out. 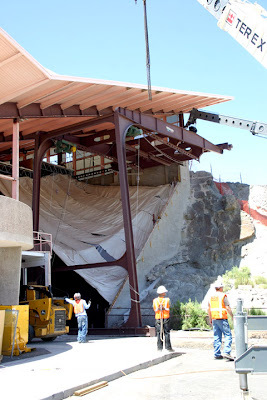 Once out far enough that it was beyond the overhang of the roof, the crane could be lifted up and moved. In the end, the pull went smoothly and only took about an hour to complete. Nevertheless, everyone breathed easier once it was finished. With the crane safely out of the building the most dangerous part of the QVC project (at least to the fossils) was over with. It was a great show and I was glad to be able to see it. 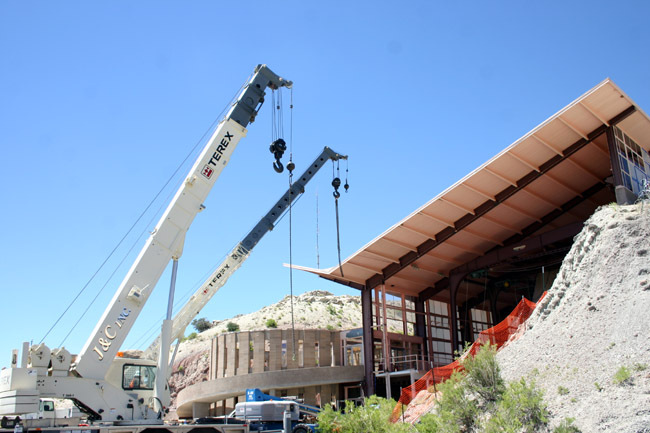 While the following true story has little to do with the construction underway at the Quarry Visitor Center, it is worth recounting because of its insight as to how things sometimes work in the government. 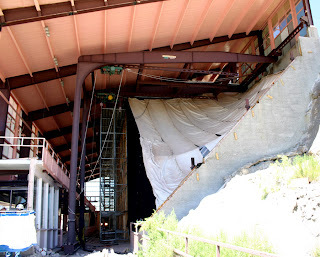 It is part of the oral history of the Quarry Visitor Center, told to me by Jim Adams and the late Tobe Wilkins, the two gentlemen who prepared most of the bones now visible on the quarry face. It’s a fitting remembrance of the crane as it heads off to recycling Valhalla. 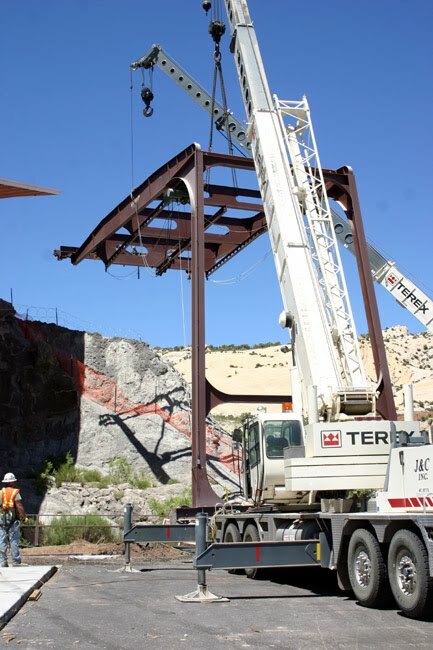 As we discussed in the previous blog, the crane weighs 28,000 pounds and is capable of carrying 8,000 pounds. It was part of the Quarry Visitor when it was built in 1957/1958 and served the important function of a platform to move overburden from high on the quarry face to ground level. There was just one slight problem. 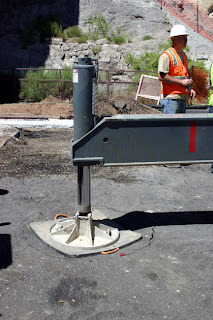 When installed, the crane was not powered. It was raised and lowered by pulling on ropes. That was bad enough when empty, but things got worse when it was carrying a full load of overburden. 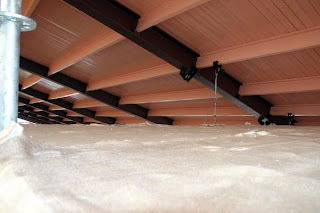 Lowering it in such conditions caused the plastic braking mechanism to heat up from friction, expand, and prevent further lowering of the basket. The only thing to do was hang there for 10 minutes or so until the plastic cooled down, shrunk, and lowering could begin again. Maybe you would be lucky and get to the ground only having to stop once. After suffering several years of this nonsense, the Monument appealed to the regional office to get the crane powered. Unfortunately, the inexplicable response was something to the effect that “The National Park Service is not in competition with the private sector in having powered cranes.” The funding request was denied. Tobe and Jim just kept on excavating, heating the plastic brakes, and spending time suspended with a load of overburden 20 feet off the ground. One day while waiting for the brakes to cool, a visitor in the Quarry Visitor Center struck up a conversation with Jim and Tobe, asking them what exactly they were doing suspended above the ground. They explained the situation and the denied request. The visitor shook his head and left. 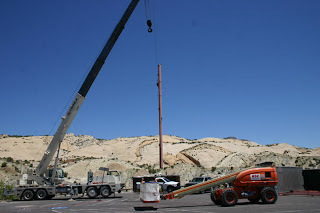 A month or so later a memo arrived from the regional office announcing that funding had become available to motorize the crane. Turns out the visitor Jim and Tobe had chatted with was a congressional staff aid. 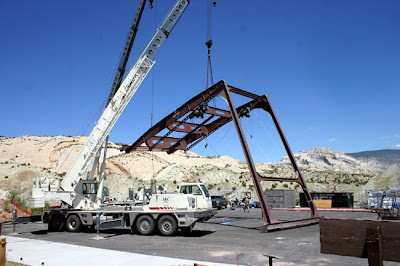 Photo courtesy of Dinosaur National Monument. 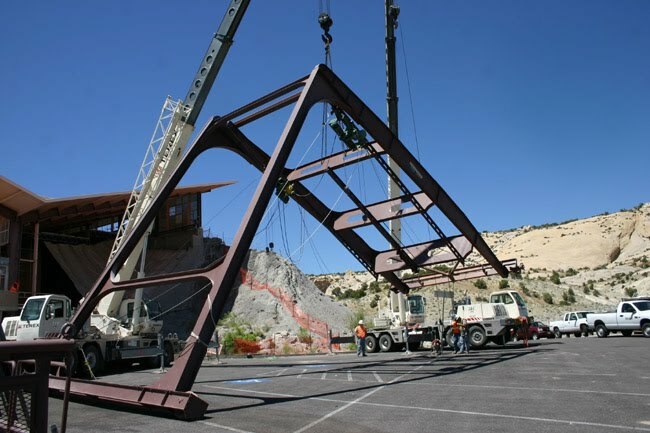 The curious reader might well ponder “Why DID Dinosaur National Monument have a crane weighing 28,000 pounds and capable of lifting 8,000 pounds INSIDE the Quarry Visitor Center? The reason is quite logical, if not obvious. 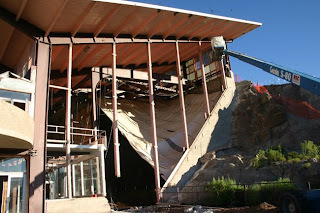 Remember, dear reader, that when the Quarry Visitor Center opened, very few of the bones now seen in the quarry were visible. Most were still entombed a meter or more deep in the dense and heavy sandstone. 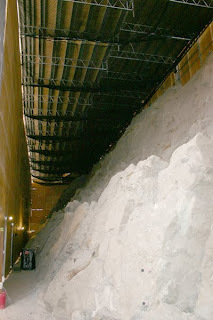 As excavations started large blocks of overburden were removed but they couldn’t simply be tumbled down from the top of the cliff face and into the visitors and exhibits. The crane, with its large working platform, served as an area to operate air hammers from. 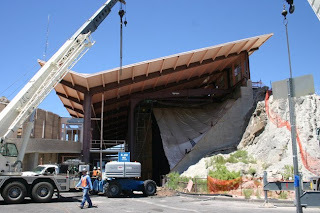 Blocks of overburden were rolled onto the platform, lowered to the ground, and then hauled away. As time went on, the crane also served as a save way to getting researchers to specimens located in the more inaccessible parts of the cliff. Some readers may remember a trip on the crane to study the magnificent Camarasaurus skull on the top center of the quarry. 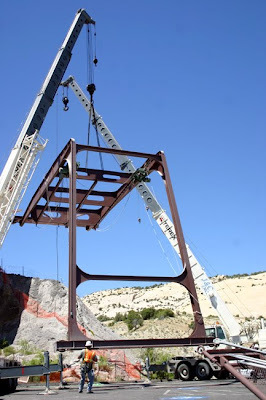 The platform also served as a work area for curatorial work on the cliff. However, the crane was getting on in years. It met no OSHA safety standards for carrying and transporting people and some damage had made its future use unlikely. 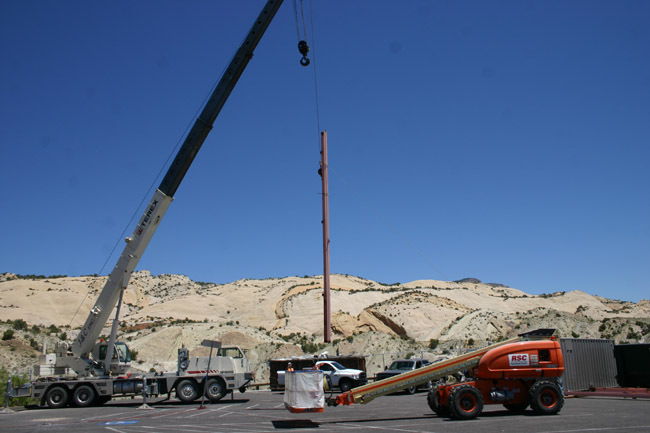 Better ways are available to get scientists to specimens and with no additional excavations planned in the quarry, there was little need for something to move overburden. As they say in the Mob "Nothing personal. Just business." 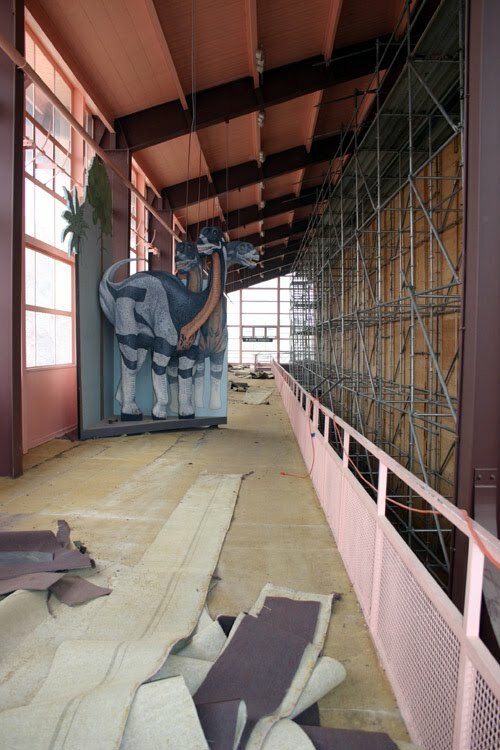 So the crane was quietly retired and will not be part of the new building. 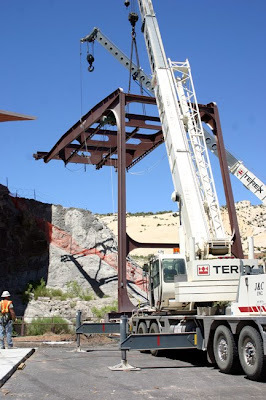 With all the window panes and frames out of the east wall, only one small matter stood in the way of getting the old crane out of the Quarry Visitor Center --- five vertical steel I-beams running from the foundation to the roof. 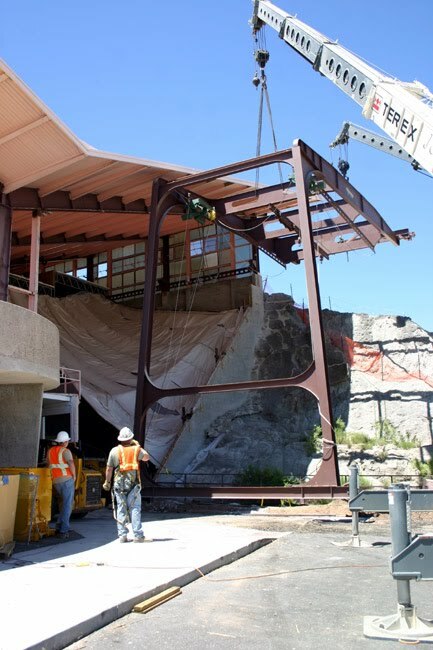 The removal started with strapping a steel cable harness around the beam and attaching that to a large crane in the parking lot. Next, cut through the beam at its contact with the roof structure using an acetylene torch. Then lift, swing, and put the beam down in the parking lot. Repeat four more times. 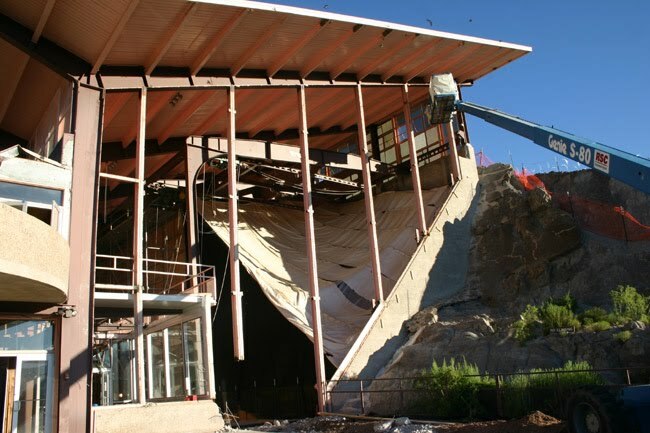 At the end this project, the east wall of windows is just one large opening --- setting the stage for the dramatic removal of the old crane from within the Quarry Visitor Center. 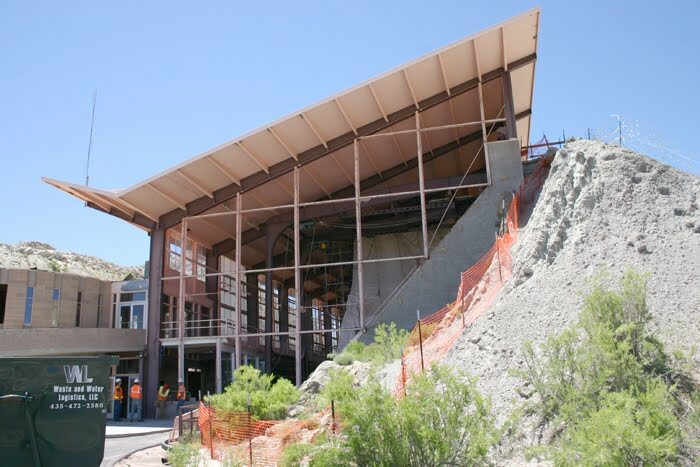 The design of the Quarry Visitor Center utilized natural rather than electric light in displaying the bones. 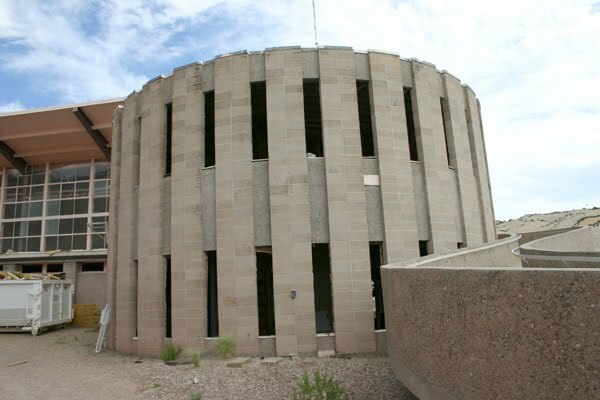 To that end, the building had expansive glass walls on the south, east, and west side to take advantage of the large amount of ambient light on the top of the hill. Those glass faces are one of the most striking design elements of the building. It was a brilliant and highly successful idea. However, as with most things in the Quarry Visitor Center, some difficulties popped up down the road. First, as time went on and the building began to move, the glass walls came under stress. Glass cracked or sometimes an entire pane would pop out of its frame. They could be replaced, although over time glass was replaced with plexiglass to reduce dangers from falling glass. The plexiglass sometimes cracked, but more often the panes would bow but stay in the frame. 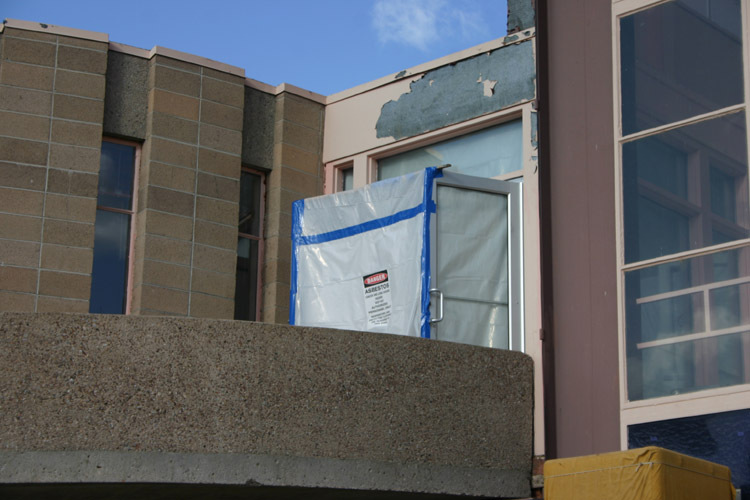 As heating and cooling costs rose, UV filtering plastic sheeting was applied to the plexiglass panels. This helped prevent cracked panes from falling out, but did little in the long run to control temperature. Over the last several decades much more energy efficient plexiglass and other plastics have been developed for use in windows. So it is no surprise that the design for the new building would include totally new glass walls. Just replace the old panes with the new ones and voila, problems solved! Well not quite…. 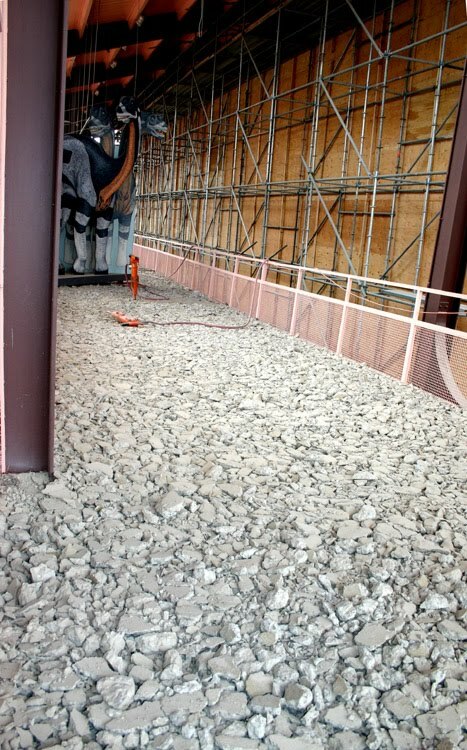 First, as you may recall from an earlier post constant reader, the entire east glass wall has pulled off of its concrete foundation wall. 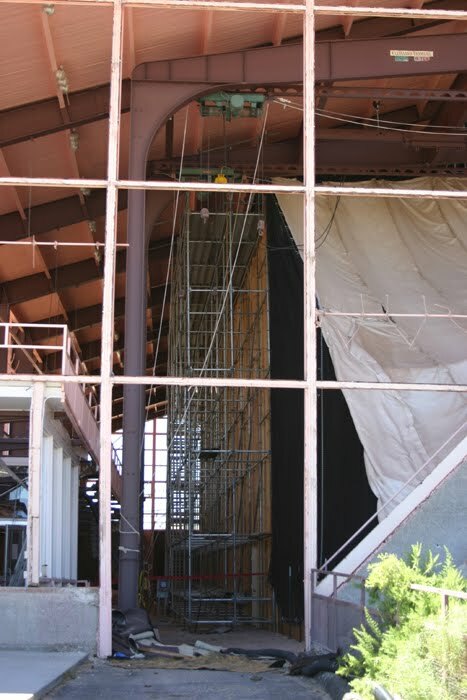 What this means is that this huge wall, including the panes, the frames, and the major steel vertical beams, are simply hanging by the welds at the top of the wall, where it joins the steel roof beams. ALL of this will need to be removed and replaced with an entirely new system. 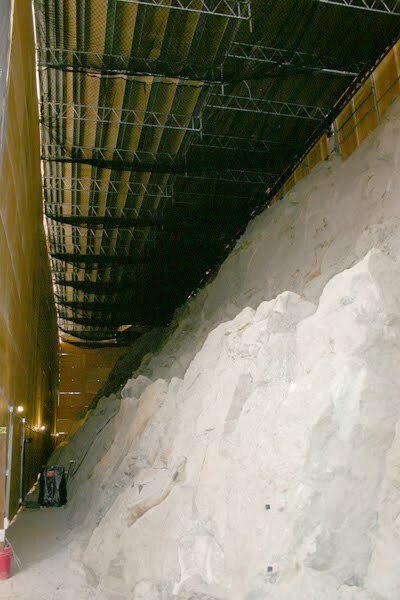 However, the east wall can’t simply be pulled down because the east wall immediately adjacent to the most fossil rich part of the quarry face, with hundreds of bones piled up in a bone jam. 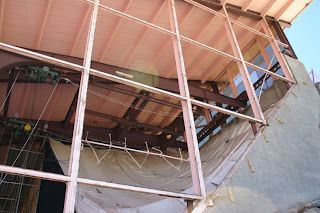 So the wall will need to be cut up and removed in sections --- first the glass and frames, then the beams. And that’s where the next difficulty appeared. It was known that lead paint was almost certainly present on the frames. 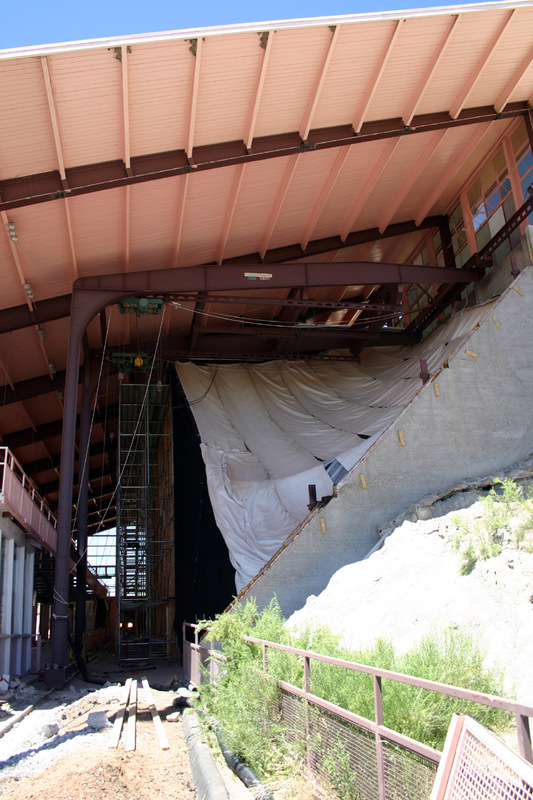 Fifty years of painting in the Quarry Visitor Center has left a structure with a paint stratigraphy in which the oldest layers are lead based. So lead abatement was planned for in the removal. What was unexpected was that asbestos was in the glazing holding the panes in their frames. That discovery delayed the project as a new abatement plan was developed. 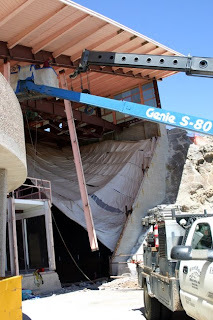 Ultimately a crane was brought in and the contractors erected a negative pressure chamber on the basket and dressed in “moon suits” and wearing breathing apparatus, used electric saws to cut away the panes and their frames. At the end of this part of the rehab project, only the vertical steel beams are left, to be removed at a later date. 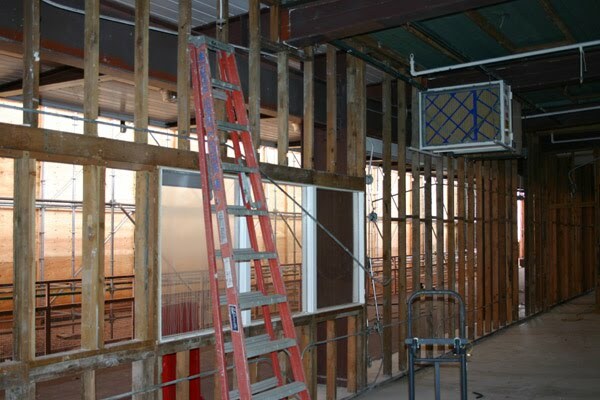 The same removal and safety system will be used to remove the glass on the other walls. Surprisingly, there is a bright side to all this drama. 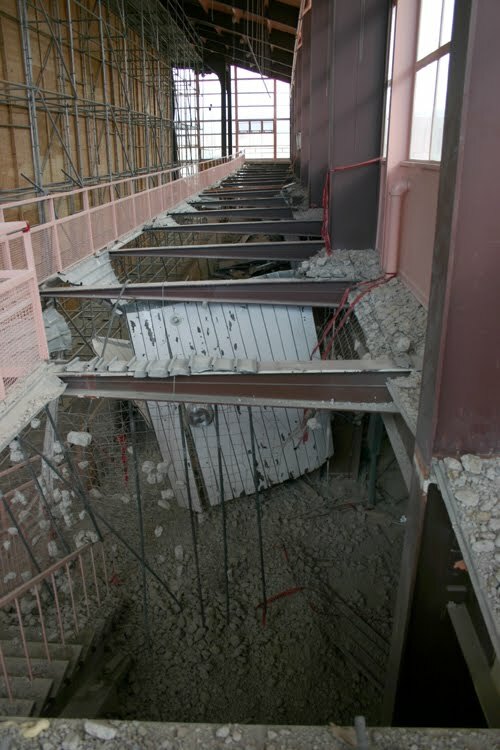 The complete removal of the east wall ends up providing a solution to the most vexing problem in the QVC project --- how to get the 4 ton crane out of the building. More on that later. Thanks to the Split Mountain Anticline just a few miles to the east, the Carnegie Quarry is ideally situated for a permanent public display. Dipping 70 degrees to the south, the surface of the sandstone body and its bones are oriented such that it is almost perfect for viewing. So when the Quarry Visitor Center was designed, the nearly 50 foot high quarry sandstone became the north wall of the building. Because of its height, viewing from the ground floor presented serious problems of foreshortening, making it difficult to see bones on the upper half of the wall. A second floor gallery along the south wall brought the visitors to level about mid-height with the sandstone wall and gave a spectacular panoramic view of the 1500 exposed fossils. 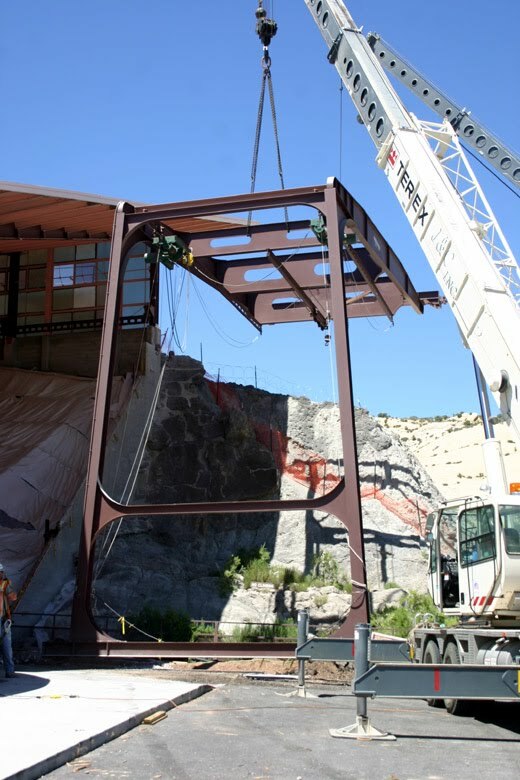 The rehabilitated Quarry Visitor Center will include a totally new and redesigned mezzanine to keep that spectacular vista. 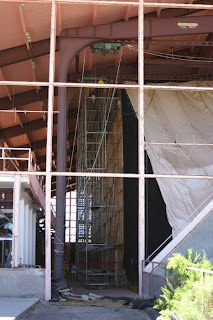 However, the new mezzanine requires the total removal of the old one. 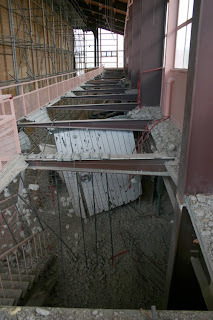 The old mezzanine sloped strongly downwards to the north and noticeably sagged for its entire length. 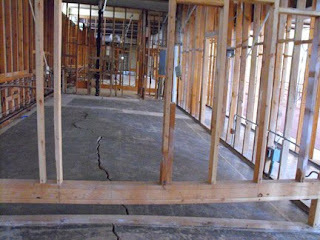 Photos showing this condition were posted in an earlier blog. 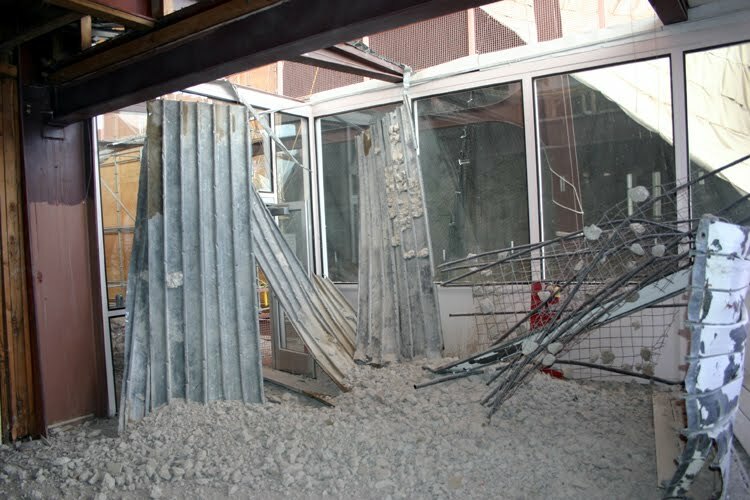 Engineers and architects who came to examine the Visitor Center usually just stared and shook their head when taken up to the second floor. 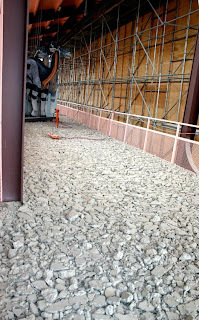 Removal required jackhammering the 2 inch thick concrete floor of the mezzanine and then cutting along the margin of each section and letting it drop to the first floor. This ended up more complicated than anticipated because of extra thick rebar in the concrete and old pipes in the concrete for a long-forgotten radiant heating system. 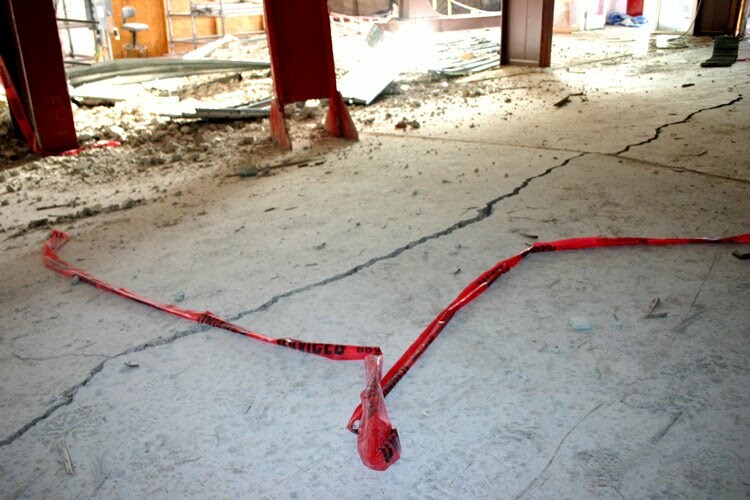 The contractors persevered and eventually the floors came tumbling down, although some pieces remained attached to the hanging rebar. 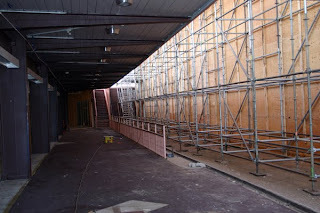 All this soon be hauled out of the building once the outer walls are removed. Paramount Pictures 1965 film Crack In The World tells the story of a scientist who sets off an atomic bomb at the center of the Earth and accidentally generates a crack which threatens to split our planet in two. Fortunately the crack turns back on itself, only cutting off a large chunk of crust that is blown into space and becomes a second moon. Well sometimes employees working in the Quarry Visitor Center thought they were living that film. Building instability bent and cracked walls and occasionally resulted in a loud metallic BOING noise that sent us scurrying to find the source of the sound (with no success). 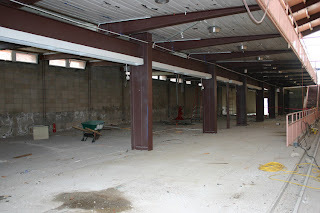 Most ominously was the ever increasing bulging of the floor for the entire length of the administrative wing which housed the lab, offices, physical plant, and bookstore. 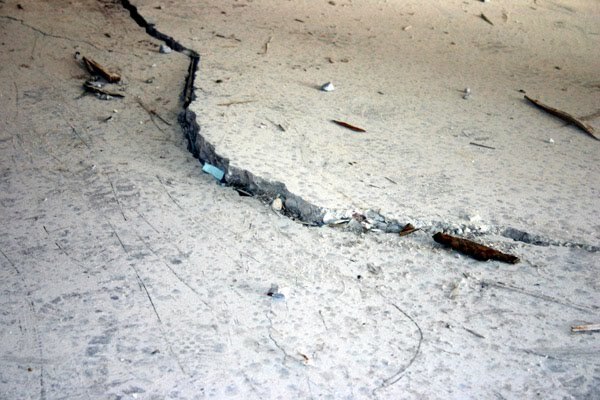 The bulge was the result of a crack, which started out hair thin but increased in length, grew to an inch in width, and eventually developed a vertical uplift of close to 2 inches along one side. You could follow it from the back end of the building eastward through the rest of the facility and then out into the parking lot. 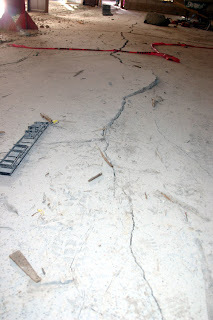 With the removal of the carpeting the crack has finally been revealed in all its splendor and horror. This magnificent chasm came about without the use of any atomic weapons, just some bentonitic mudstone and water. 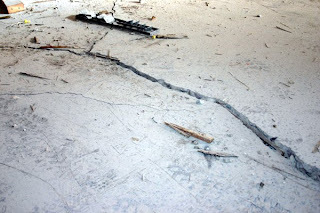 With the administrative wing slated for removal and not being replaced, this crack should not be a problem in the new Quarry Visitor Center. Dinosaur’s own Crack In The World will eventually become just another bit of oral history about the Monument. And maybe the subject of a poorly done original movie on the SyFy Channel. Once the asbestos problem with the drywall was abated, demolition could move ahead. 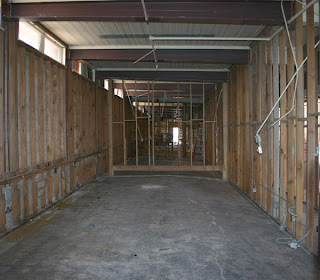 With the drywall removed we can now see the skeleton of the building that protects the skeletons. 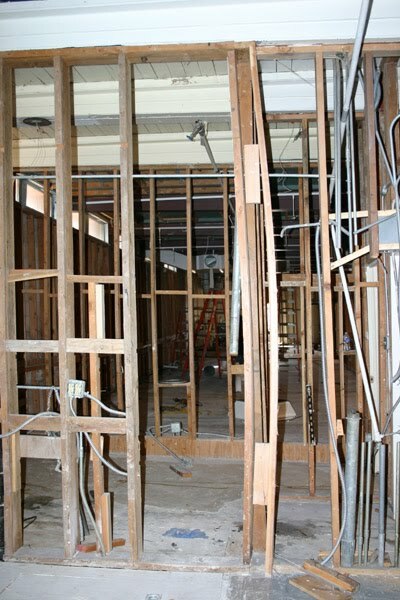 Many walls had peculiar bends and warps in them, and being able to see the framing shows why. 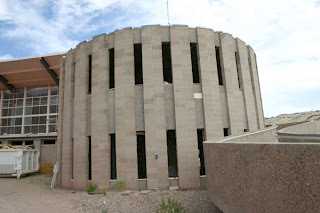 The uplifting of the south side of the building by the hydrophilic bentonitic mudstone underlying it put extreme vertical pressure on the 2x4s, bowing them or sometimes splitting them vertically. 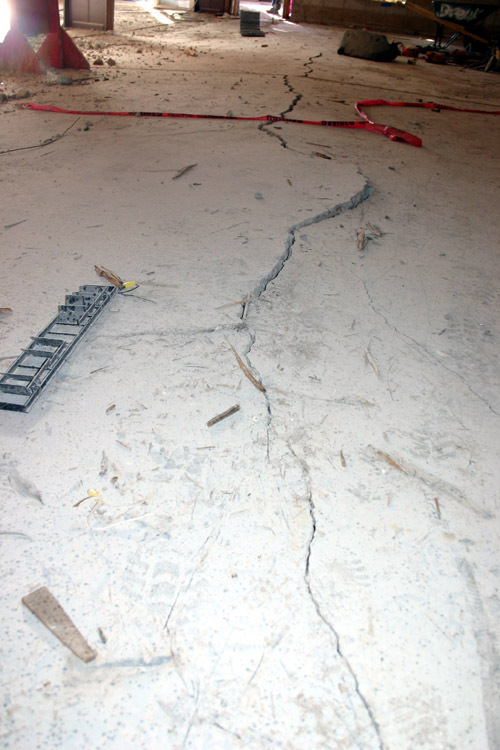 The framing also shows how strongly the concrete floor sloped to the north. 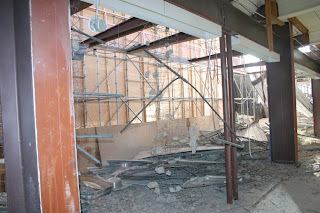 Once the framing itself was removed, all that was left in the administrative wing was the steel girders, whose exciting removal will occur in a few weeks. 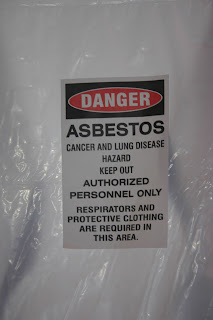 In an earlier post I discussed hidden dangers that appear in older buildings, with asbestos being a main culprit. 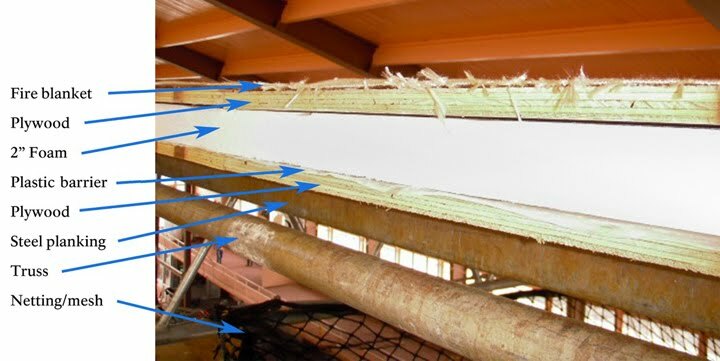 Asbestos was widely used in construction beginning in the late 19th century because of its sound absorption, average tensile strength, and its resistance to heat, electrical and chemical damage (1). Having been built in 1957, the Quarry Visitor Center contained asbestos in pipe insulation, drywall, mud, and elsewhere. Much of that was identified with signs years ago. When time came to demolish the old building it was necessary to remove the asbestos before demolition of the walls and heating system. First with the second floor and second with the first, abatement involved using plastic to enclose rooms and using negative pressure to prevent asbestos escaping during removal. 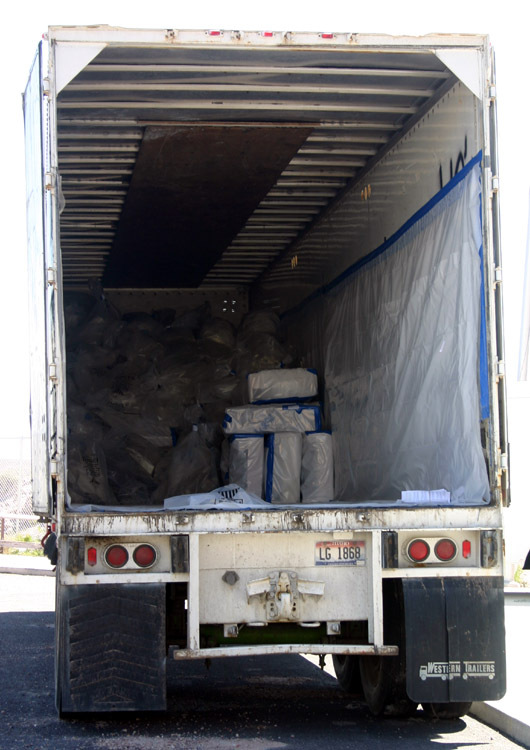 Removed materials were bagged and secured and loaded into a special trailer. Then it was taken for proper disposal. 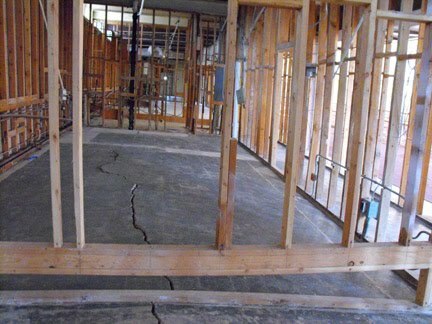 Certified contractors specializing in abatement do this work. 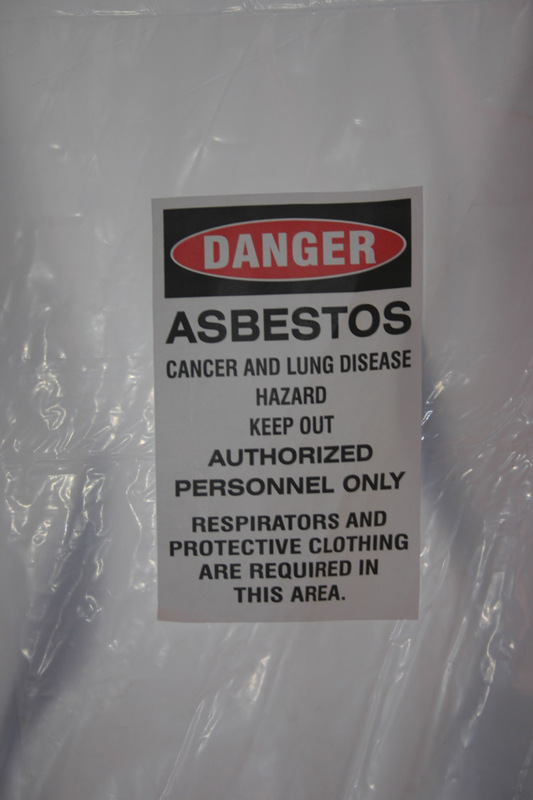 However, given the wide use of asbestos in the past, it was almost inevitable that unknown occurrences of asbestos would turn up. Such happened when removing the roof of the administrative wing and asbestos rich tar paper turned up beneath the wooden slats of the roof. This brings work to a halt while the discovery is sampled, its hazard analyzed, and a safe removal plan developed. 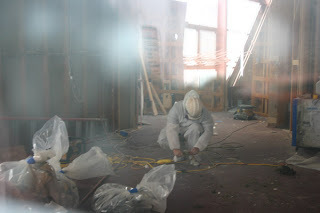 Such matters take some time and demolition can be frustratingly halted --- but asbestos is a health hazard and so there is little choice. It was recognized as early as the first century AD that slaves weaving asbestos clothing in the Roman Empire often had a lung sickness (1). 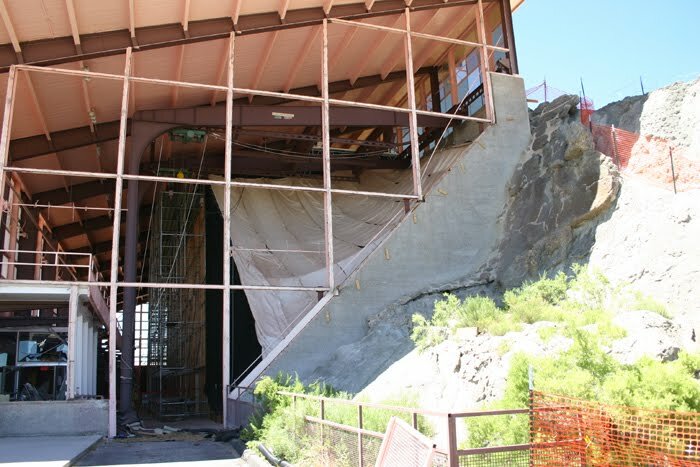 After several weeks of work, including several unexpected problems thrown up by the structurally failing Quarry Visitor Center, the protective box enclosing the Carnegie Quarry is nearly complete. 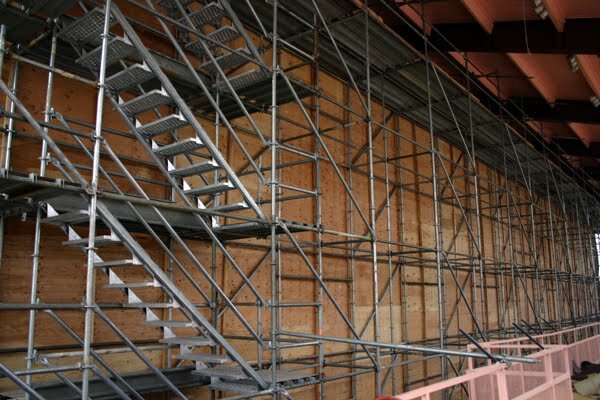 The size of this protective structure is impressive, running 150 feet in length, 50 feet in height, and 30 feet in width.The framework is a scaffolding and truss system. 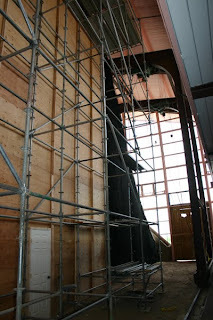 The vertical walls of the box are made of plywood. 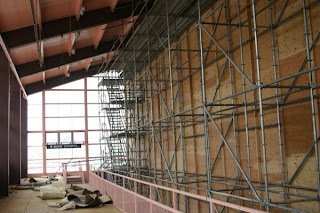 The top of the box will also serve as the work platform as the buildings ceiling and roof structure is redone. 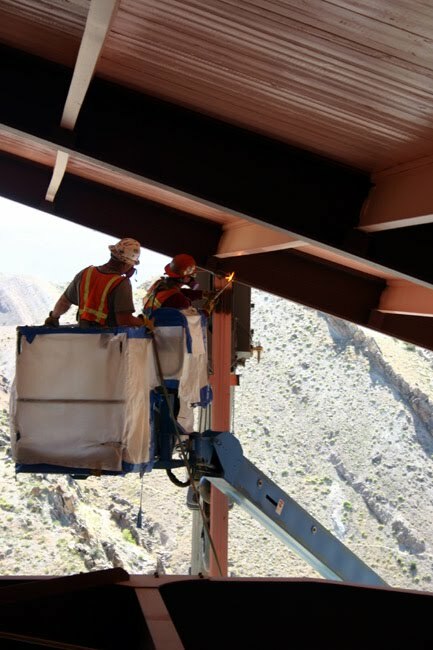 Because of the work that will be done using the top of the box, additional protection is provided on that part of the structure. On the top is a fire blanket to protect against sparks during welding and cutting. Beneath this is plywood, then a 2 inch thick layer of foam, followed by a plastic moisture barrier, and another layer of plywood. 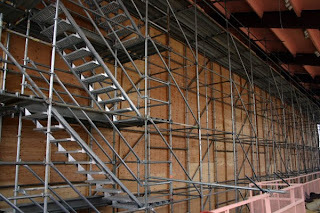 All of this sits atop the truss and steel planking. Finally, below all of this is a suspended layer of mesh and reinforcing rope netting to catch any item that might fall and somehow get through. So finally, the Carnegie Quarry can be safely put to rest in its sarcophagus and the demolition of other parts of the Quarry Visitor Center can begin. Well almost. 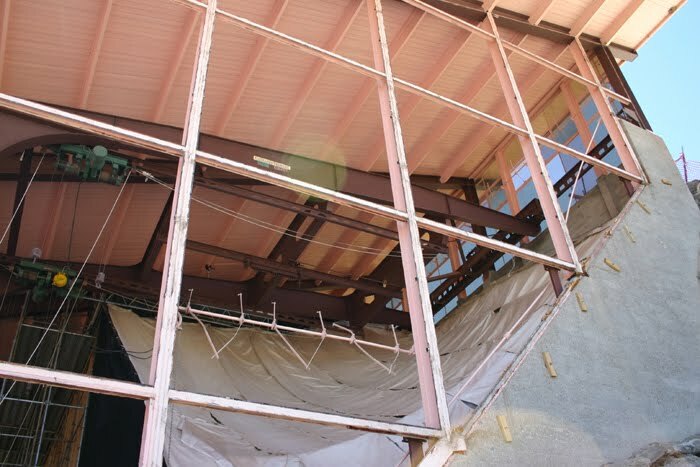 There is the little matter of the 4-ton 50 foot high steel hoist still inside the east end of the building (see last photo). Completion of the protective box awaits the crane’s dramatic exit from the Visitor Center sometime in late June.